I had the perfect ride on Smokey today. I did a little round-pen work with her first, she was willing and respectful, and then rode out with Merri and Dudley to check out the Hart Creek trail. It's one of my favorite trails - about 13 miles, first traversing some nice hills and washes out of the ranch, then onto a lovely sandy single track trail ('Merri's Trail') which takes us down to Hart Creek - which was running nicely, plenty of snow melt this year. The trail follows the fence line above an old ranch, parallel to the creek, and then drops down to the water. Sometimes we ride through the creek for a half mile or so but today we took a sandy trail through the sagebrush and down to 'Oreana Savanah' - a cool cave that hides back in the cliffs surrounded by brush and willows. The trail then heads up into some badland formations - white and yellow cliffs with red rock caps and rings, very prehistoric looking. We follow a wash back towards Hart Creek, ride a narrow trail above it, and then ride through another old homestead with rusty farm equipment, a ghostly old cottonwood tree, and an old stone house built into a hillside. There were quite a few mama cows and brand new babies. And a scruffy old bull. We climb up a rocky hillside and drop down to the mouth of Hart Creek Canyon, a spectacular rhyolite cliff gouged out over a million years ago as Lake Idaho drained into the Snake River. We ride past the canyon, the mouth is dense with brush and the trails into the canyon are only suitable for wildlife and adventurous humans. There are Indian artifacts up this canyon, I imagine it was magical for the earlier humans as well as we late comers. We ride up out of the canyon mouth along sagebrush trails and washes and then quickly climb up a narrow ridge and back up onto the bench - where one can see in every direction. 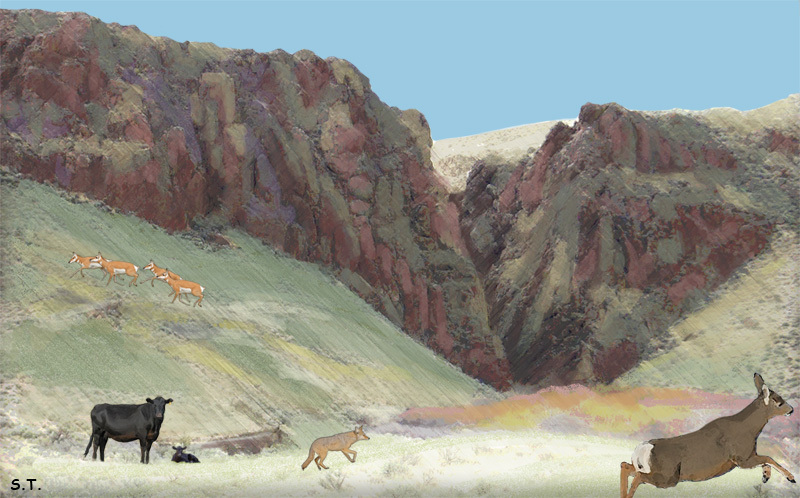 The Owyhee Mountains to the west, the Boise mountains to the north, the Sawtooth mountains far to the east. Then cross country up the hills and down into the washes and up the hills again. We met up with John and his beautiful mare Sunny as we dropped down into Pickett Creek and our land. He had been riding the southern fenceline checking for sections that might need shoring up. Our neighbor's cows have been wandering into our little valley to have their spring babies. This year we'll try to keep them out. Finishing a nice trail along Pickett Creek and then home. We were lucky enough to see two different herds of mule deer, and large herd of antelope, and a coyote that we followed for a while as he skirted us, perhaps on the scent of the mule deer.